So what exactly is this Tableau thing, anyways? I asked that same question several months ago, but once I got familiar with it, I never looked back. Tableau is an incredibly powerful data visualization platform that allows you to craft interactive visualizations (or as some call them for short, “vizzes”). Tableau is primarily used for business intelligence. However, it can be used for anything from a series of charts showing changes in a city’s population density over time to comparing your favorite football team’s stats to its rivals. At this point, you might be wondering what exactly Tableau has to do with maps. Tableau visualizations give your audience the opportunity to explore the data that is being presented. One of the best ways to explore data is with, well, maps. Tableau contains a fairly comprehensive and easy-to-use set of mapping capabilities. It can read a variety of spatial files, including GeoJSON, MapInfo, KML, and shapefile formats. It’s also integrated with Mapbox, which allows you to import custom basemaps if you’re feeling fancy. Using maps in Tableau provides your audience with the ability to better interpret the “where” aspect of your visualizations. There’s some Tableau lingo that’s important to know before diving in. Tableau is essentially made up of worksheets, dashboards, and stories. A worksheet is the equivalent to your workspace – this is where you create a chart or visual or make calculations, among other things. You place the visuals that you create in your worksheets onto your dashboards or stories, which are sort of like blank palettes for your visualizations. Once you create your dashboard or story, you can save it to Tableau Public. Once published, you can share your viz with others or even embed it on a blog or website. Enough with the overview though – let’s explore some vizzes with maps! The dashboards below, which span a variety of topics, incorporate maps in different ways. 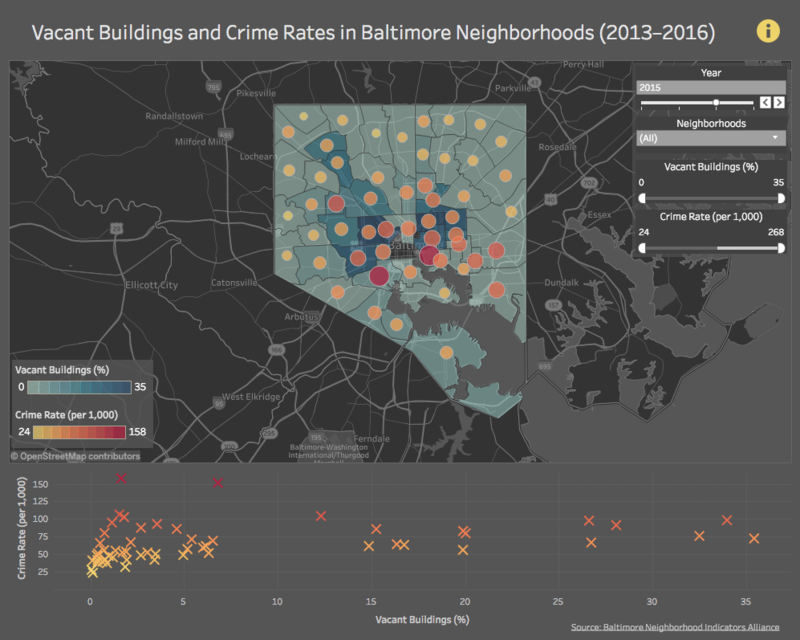 I created a dashboard that examines the percentage of abandoned/vacant buildings versus the crime rates of Baltimore neighborhoods from 2013–2016. The chart included on this dashboard might be useful on its own, but the incorporation of a choropleth/graduated symbol map serves as a particularly important component of this visualization. A user can simply hover on a neighborhood or a point on the scatter plot and immediately make the spatial connection between a neighborhood and its data values. 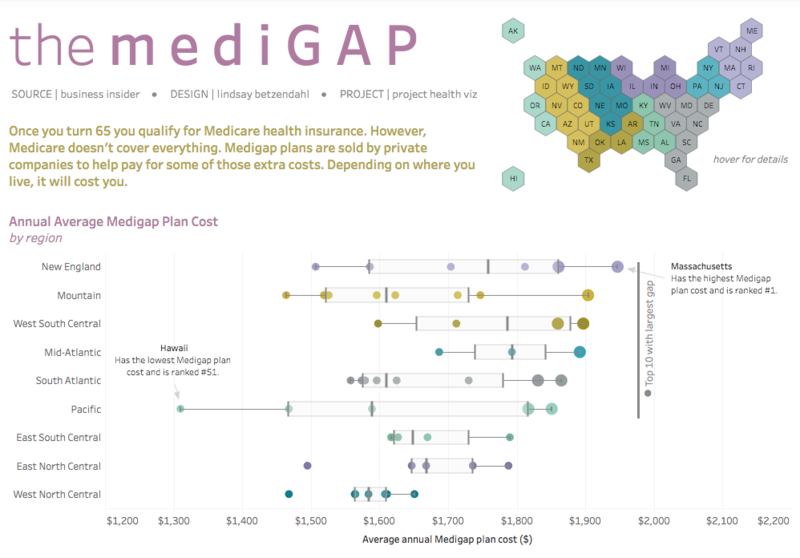 The viz below explores the average cost of supplemental healthcare plans in the US for citizens over 65 that fill the gaps of Medicare health insurance. The inclusion of the simple, tile-gridded map allows the user to easily make a spatial connection with the data. It also lends insight into which regions of the US may rank higher or lower on healthcare costs for senior citizens. Let’s check out a viz that’s a little more fun, which also happens to involve my favorite caffeinated beverage. 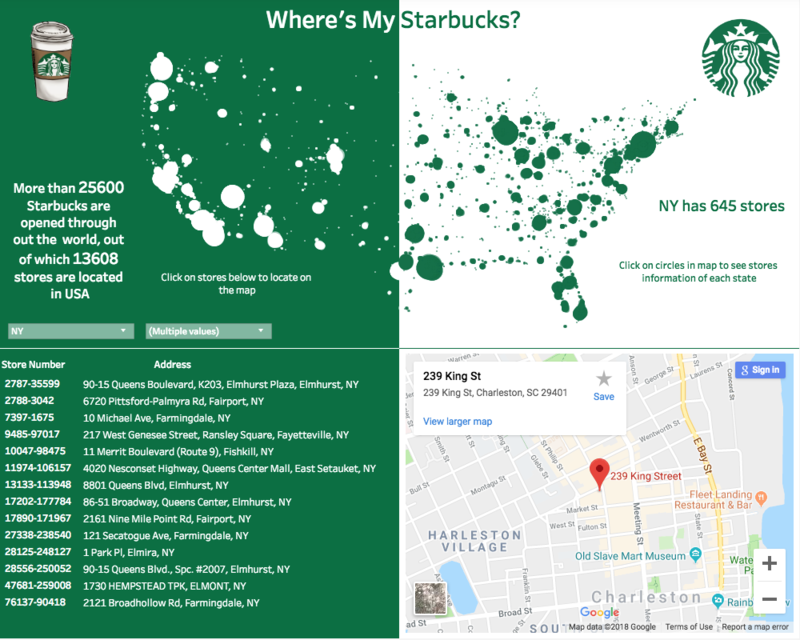 This dashboard shows the distribution of Starbucks locations across the US. The user can choose their location, or even multiple ones, and explore further from there using the google maps panel that is integrated into the dashboard. Like with anything, there are pros and cons to using Tableau. The most important (and obvious) benefit to mention is Tableau’s robust data visualization capabilities. It gives you and your audience the freedom to really unleash the power of the data you are utilizing. Also, the learning curve isn’t too steep. If you’re willing to get your feet wet and make some mistakes (I certainly have), you’ll master the basics in no time. Another great aspect of Tableau is the level of customization. There is almost always a workaround to achieve something that isn’t readily apparent in the software. Additionally, there exists an active and supportive online community that can help you learn the ins and outs of Tableau. This can be a lifesaver when you’re stumped on anything from getting your dual-axis chart to display correctly to mastering some advanced calculations to further enhance your viz. On the other hand, you may encounter some challenges if you’re looking to create a dashboard with perfectly aligned and sized objects to then place in a printed report. The formatting capabilities of Tableau are lacking in several respects. To be honest, it’s because Tableau isn’t really meant for that; the platform is more geared towards creating unique visualizations that are to be interacted with online. However, the limited formatting features are a drawback if you are working on a project that requires precise design specifications. Exporting your vizzes to PDFs or other file formats are another issue. Your dashboard might look picture-perfect on your desktop, but come out with mismatched formatting and colors once exported to a PDF or uploaded onto Tableau Public. Some solutions exist out there for these issues, but they can be time-consuming and they don’t always work. General pros and cons aside, the mapping capabilities in Tableau are well-integrated into the software. They also align well with Tableau’s creed of allowing your audience to interact with the visualization being presented to them. It gives anyone, even if you’re not a spatial expert, the power to incorporate the “where” component of a dataset into your visualization. This capability should never be underestimated. Excited to create awesome visualizations (which will hopefully include some maps!) but need some inspiration? The Tableau Public gallery is a wonderful place to start and can be accessed here.